The History of Blood & Honour ~ When The Storm Breaks! In 1987, the skinhead movement under the White Noise Club was at the forefront of the musical revolution called 'Rock Against Communism'. Bands like Skrewdriver, Brutal Attack, Skullhead, and No Remorse and many more played weekly up and down Great Britain to crowds of up to a thousand. It was underground with no advertising and crowds attending through word of mouth. The skinhead scene in Great Britain was financing the right wing resistance movement in the whole of Europe and receiving very little in return. 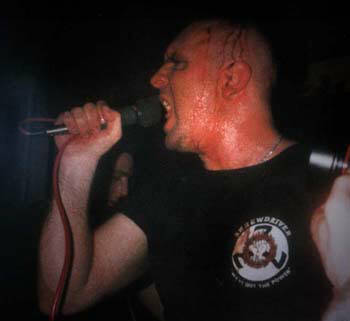 Skrewdriver, led by Ian Stuart first performed the song Blood and Honour in 1985 and it was a song that would become an anthem then flagship for generations of people to come who were far sighted enough to see the abyss our people, culture and future faced if we continued on the road we were taking. London skinheads who followed Skrewdriver began adopting the name Blood and Honour skins, and ruled the roost in all skinhead meeting points around the capital. Last Resort, North, East, South, and West London Skins all began dropping their respective names to come under the legend that was forming as Blood and Honour! Disillusioned by mounting proof that the people controlling the White Noise Club were nothing but self promoting profiteers who cared nothing for the skinheads or music scene it represented, and the fact thousands upon thousands of pounds were being made and nothing was being put back to enhance the scene, Ian Stuart called a meeting. Those present were all the 'top faces' of the London scene, bands Skrewdriver, Brutal Attack, Sudden Impact, Squadron and British Movement bands who would have nothing to do with the corrupt White Noise Club, like No Remorse and The Ovaltinees, with representatives from political parties who would normally distance themselves from each other, all met, and agreed to support a new confederacy, a group run by the people it represented, aligned to no single group or movement but that just existed to support anyone, in any way it could, who fought for our people, whether they be right wing racists, patriots, Nationalists to National Socialist freedom fighters. A confederation that supported all good honourable activists and activities, and expected nothing in return, and indeed needed nothing, as it would be self-supporting in every way. The independent voice, of the right wing resistance movement. Blood and Honour! was born, a movement built around musical revolution, with no party barriers to hinder the fight! In July 1987, the first issue of the now world famous Blood and Honour magazine was released, under the banner of Blood & Honour 'The Independent Voice of Rock Against Communism, When the Storm Breaks!' and break it did. From these humble beginnings now part of skinhead folklore, Blood and Honour has evolved beyond recognition. From a movement based solely around the skinhead scene and Oi! music, different 'cults' and musical styles have all rallied under the banner in the struggle of our people, Rockabilly, Hatecore, White Rock and Nationalist ballads are but a few. The Official magazine, now well past it's 20th year, despite continual and massive State pressure, runs every three months and is still growing at every print, some of the original contributors still playing a major part. Many of the founding bands like Brutal Attack, still fly the flag and concerts, meetings and socials are held monthly. National concerts like the Violent Storm Memorial in March, St George's Day in April, Ian Stuart Memorial in September and White Christmas in December have become international festivals beyond frontiers and national boundaries with hundreds attending from all around the white world, all adding to our domestic might and fight for our glorious cause. The quality, number and professionalism of the bands have also grown. Our bands and music, from its humble beginnings within the shores of Great Britain have spawned a global music scene and way of life, a movement giving hope, financing and advertising the good fight. From the original loose confederation Blood and Honour has evolved into a tight organisation, active groups of thirty plus becoming Divisions, smaller groups being given sectional status, all politically active and aligned to the party or movement of their choice, neither Divisional or Section status is awarded lightly, it has to be earnt not bought. With the success of Blood and Honour within Great Britain, and the massive amount of support globally, international divisions of Blood and Honour began, from the first in Australia (1993) and other white Commonwealth countries, the movement has grown to cover countries in all four corners of the globe, all working under their own respective countries laws in what way they see fit, to further our mutual aims. Sadly our founder and leader Ian Stuart Donaldson was taken from us in 1993. But his legacy has remained and flourished, his dream of a movement run by and for skinheads, behind a musical front remains, and has grown into a confederation of like minded people, stronger than ever. A movement, offering people an alternative lifestyle to the drug infested, pro homosexual, race mixing scene fanatically pushed by today's powers to be, is giving hope to thousands around the world. Hail Ian Stuart! Hail Blood & Honour! Hail the New Dawn!